Over the past 3 months US, UK and other forces have carried out airstrikes against ISIS in Iraq and Syria using manned aircraft and drones. There is little public available information as yet about the impact of these strikes on the ground . Here’s is what we know – and don’t know – so far. On August 7, President Obama ordered what he called “limited strikes” against ISIS in order to protect American personnel in Iraq. At the same time he stated that he would “not allow the United States to be dragged into fighting another war in Iraq”. US airstrikes began that next day and initiated another US military intervention in Iraq that has subsequently been named Operation Inherent Resolve. “America will lead a broad coalition to roll back this terrorist threat. Our objective is clear: We will degrade, and ultimately destroy, ISIL through a comprehensive and sustained counterterrorism strategy. In June, I deployed several hundred American service members to Iraq to assess how we can best support Iraqi security forces. Now that those teams have completed their work –- and Iraq has formed a government –- we will send an additional 475 service members to Iraq. As I have said before, these American forces will not have a combat mission –- we will not get dragged into another ground war in Iraq. It should be noted that there has been no UN resolution on the military action by the US and its partners, casting doubt on the legality of the action, although some insist that as the – hastily assembled and installed – new government in Iraq has consented to military assistance, this gives legal cover under international law. In the UK, many MPs argued strongly that no military action should take place in Syria without a UN resolution and further parliamentary debate. Indeed the motion passed by MPs directly stated “this motion does not endorse UK air strikes in Syria as part of this campaign, and any proposal to do so would be subject to a separate vote in parliament.” However within days of the vote, the Government were arguing that the UK may “need” to intervene in Syria. For details of US, UK and other nations military airstrikes in Iraq and Syria see the very useful and regularly updated datasets by Chris Woods that are here and here. Two months before Obama even initiated air strikes in Iraq, armed US Predator drones were already flying over Iraq on reconnaissance missions and to protect the US troops sent to ‘assist and advise’. On September 27, two days after MPs gave approval following a parliamentary debate, UK forces began air combat operations in Iraq using Tornado aircraft, with the first UK airstrike taking place on 30 September. Two weeks later the UK confirmed that it was re-deploying two armed Reaper drones from Afghanistan for operations in Iraq and these have now begun flying missions over Iraq. On 5 November the Defence Secretary Michael Fallon announced that the UK was sending more Reapers drones (said by some sources to be another two) to Iraq and Syria. According to an August 2014 Washington Post piece, US military aircraft undertaking airstrikes in Iraq have been flying from bases in the Gulf as well as from USS George H.W. Bush, an aircraft carrier in the Persian Gulf. The US has also confirmed that it using Erbil (sometimes named as Irbil or Arbil) in Iraqi Kurdistan as a base for its military aircraft. Despite persistent rumours, US military spokesperson insists that it not being used by drones. However the base is also being used as a “Joint Operating Center” by US and Iraqi force and there an adjacent CIA facility which is reportedly being expanded. Possibly then there are drones in Erbil but under CIA rather than US military command. Four US drones have used Incirlik airbase in Turkey to undertake surveillance flights against the PKK in Iraq since November 2011 (one was shot down in September 2012). Although these unarmed flights appear to have continued, Turkey has been reluctant to join the US coalition in part due to the kidnapping of almost 50 Turkish Consulate staff and children when Mosul was overrun by ISIS in June 2014, and partly due to political differences over the response to ISIS. Even though the hostages have now been released, tensions between the US and Turkey remain. Recent reports appear to confirm that Turkey is allowing unarmed US drones to use Incirlik for surveillance flights over Syria and Iraq only. While the MoD has been happy to report the location of UK Tornado aircraft flying over Iraq as RAF Akrotiri in Cyprus (with the RAF station commander even giving news conference from the main gate) the MoD is being tight-lipped about the basing of its drones, leading to media reports give several different locations. The Independent says that the UK Reapers “will be based in Kuwait” while the FT reports that they will “have to be based inside Iraq” with a source suggesting either Balad or Erbil airbases. Conversely Sky News stated they will be based “outside of Iraq” somewhere in the Middle East. As we have suggested previously it is likely to be either Al Minhad in UAE, RAF Akrotiri or Kuwait but without confirmation from the MoD it is not possible at this stage to be certain. One question about all this of course is, if drones are no different from manned aircraft as the MoD repeatedly insists, why are they happy to give the location for the base of the Tornadoes but not the Reapers? Around 800 airstrikes have taken place in Iraq and Syria over the past three months, the vast majority undertaken by US forces. The British-based Syrian Observatory for Human Rights has estimated that more than 550 people have been killed in airstrikes on Syria including at least 32 civilians. 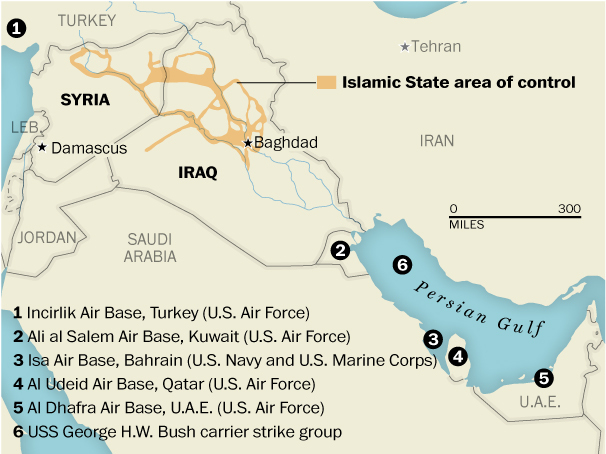 There is little information about casualties from airstrikes in Iraq. A table of credible claims of civilians casualties compiled by freelance reporter Chris Woods is below, but there are certain to be other incidents. 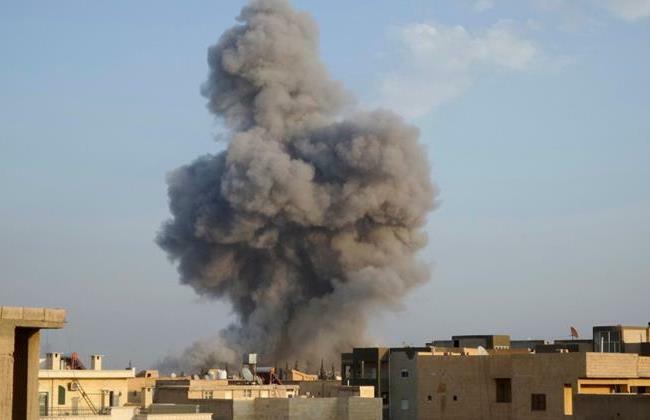 Oct 8th Mosul, Iraq US – fighter/ attack aircraft First US strike on Mosul city targets ISIL vehicles. Agency stringers report possible civcas. Waiting on further details. * Extensive additional civilian casualties are often caused by other parties to both the Iraq and Syria conflicts. Western leaders have warned that the air campaign against ISIS in Iraq and Syria is likely to be a long one – years of airstrikes are being talked about. The impact of these strikes on the ground must be carefully assessed and this requires real transparency from those carrying them out. More importantly the danger and damage being done both on the ground and to international security by this air campaign must be acknowledged and the numerous alternatives to airstrikes – see here and here must be properly engaged with.